Why we use ammonia in refrigeration. This chemical is a compound of nitrogen and hydrogen and colourless. Commercially its main use is in fertiliser, and it is also commonly found in household cleaners, specifically glass cleaners as it doesn’t leave streaks! In our business, it is also excellent in refrigeration because of its chemical cooling properties. The most distinctive characteristic about ammonia is that it has a very pungent smell, whilst this can be off-putting, in our line of work it does have a good advantage, which we will come to later in the blog. Why is ammonia so good for industrial refrigeration? It is not just good for industrial refrigeration, but commercial refrigeration and air-conditioning as well. This is because of its chemical breakdown – and without going completely in-depth as far as the chemistry is concerned, ammonia is able to absorb a really substantial amount of heat from all of its surroundings. 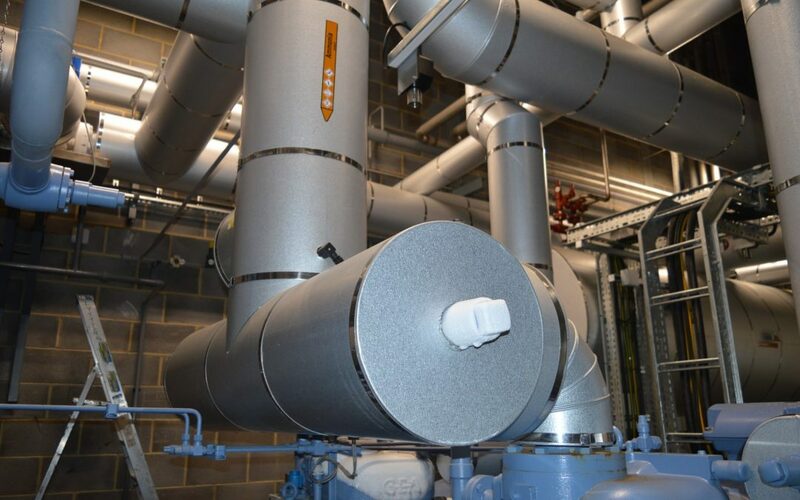 This means as a gas it is ideal for cooling areas very rapidly and bringing the temperature to the required level via a controlled environment, such as a refrigeration plant. We use pumps to push liquid ammonia around the system through a series of coils that evaporate and make the ammonia a gas and help it absorb the heat, then it is returned back to condenser coils where it turns back to liquid and loses the heat using condenser fans. This is a very basic overview of a typical ammonia system! Isn’t ammonia dangerous to us? It actually is found in the natural environment; ammonia is present in the soil, the air, and water. It is even present in us humans – in fact, ammonia and its ions are a vital part of the human metabolic system and play an important part in human health. So, in its natural and low-level form, ammonia doesn’t pose a threat. It is only when there are very large doses and a high concentration of the gas is in the air that problems may occur – these are normally irritations to the throat, eyes, and lungs. Burns of the skin may also occur. However, in our industry, we have very strict safety standards, and any issues with ammonia are kept to an absolute minimum and it remains one of the safest gases to use for refrigeration purposes. How are the risks minimised? As part of every installation that uses ammonia, we use the best equipment to deliver the results that are expected. One of the safety mechanisms is the isolation of the ammonia in the system – so for example, if the gas is smelt in the rare case of a leak, it can be quickly investigated, and the problem isolated at the source. This is the reason the pungent smell of the gas is actually a benefit – even if it has been likened to sweat or cat urine! The main thing is once you have smelt the gas, you can’t mistake it and action can be taken. So, are your refrigeration plants easily maintained? Very much so! As part of the planning process with all clients, we always ensure good access to maintain all the equipment, regardless of whether it uses ammonia or not. Maintenance and safety are paramount to ensure that equipment runs as expected and all personnel are safe in their working environments. Of course, your staff won’t be expected to maintain the systems and equipment themselves, that is what we are here for, so having a maintenance programme in place, as well as regular servicing, will keep everything running like clockwork. Are there other types of refrigeration? There are indeed. There are several types of refrigeration and we have vast experience in them all. The main reason we prefer using ammonia in our refrigeration systems is that it has zero global warming properties, so is non-damaging to the environment as a refrigeration gas. Our team will always cheerfully discuss requirements for industrial refrigeration, commercial regeneration or air-conditioning systems, so please feel free to call us. Hopefully, this explains a bit more about ammonia and why we use it in our refrigeration equipment and plants. It has been used in this way for a very long time, and because of its property of not impacting on global warming, it is definitely the preferred choice for us. To speak to our very experienced and friendly team about ammonia refrigeration, or any other requirements that you need, please get in touch with us and we will be happy to discuss any projects and to answer your questions. Containerised ammonia plant room for the Outer Hebrides. What does being an independent business mean to EJM and you?